This boxed set contains four wooden runic dice and the author's guide book describing ten complete systems of divination by rune dice, as well as its use in ritual magic. 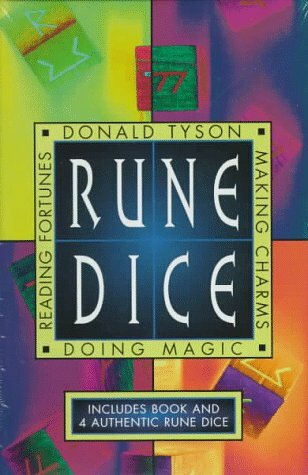 Since their invention by Donald Tyson more than ten years ago, rune dice have become a significant and popular medium for casting these magical symbols. Within moments of casting the dice, you can reveal unknown or secret matters of the past or present. 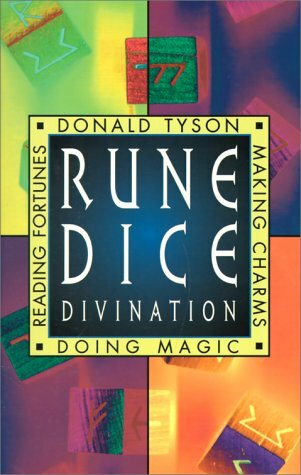 Now, for the first time, here is the complete system of divination by rune dice, a system founded on authentic historic source material.The Rune Dice kit is the only system to explain in detail the uses of the dice in both divination and ritual magic. Learn ten different methods for divination, nine of which require only a single cast of the dice. Add subtlety and depth of meaning through "pattern matrices" -- simple radial grids drawn on the surface where the dice are cast -- which focus the runes like a laser to investigate specific issues such as partnerships, family, personalities and timelines.The entire scope of rune magic is contained in these four small cubes. Use them to unlock the mystery and power of the runes.